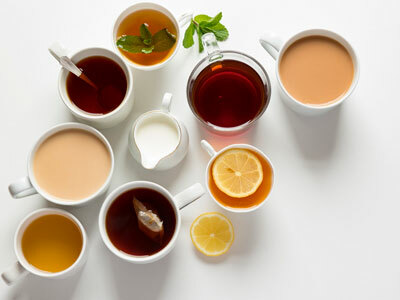 Winter is here, which means it is starting to become the perfect temperature for tea time at all times. Arin Murphy-Hiscock, author of THE HOUSE WITCH, shares her tea and herbal tips. The most basic way to make a tea is by steeping fresh or dried plant matter in very hot water, or infusing it. The resulting liquid is called an infusion. This method is most effective for leaves, flowers, and crushed fruit. If the plant matter is chunky or dense, as bark, roots, or needles tend to be, then a decoction is called for. A decoction is made by actually boiling or heating the plant matter in water for a longer period of time. For a longer-lasting liquid form, a tincture can be made. A tincture is generally also stronger than an infusion. It is made by infusing plant matter in a stable, long-lived base, such as alcohol or glycerin. Here are some examples of basic infusions and decoctions. To make herbal or floral water, place approximately a double handful of your chosen plant matter in a sterilized covered bottle or jar. Pour boiling water over it until it just covers the plant matter. Cover with the lid, shake, and leave to cool and steep. Shake it two or three times weekly. After about ten days, strain and store the water in a clean jar or bottle. It will keep in the refrigerator for one to two weeks. If you wish to intensify the scent, steep a new batch of plant matter in the infusion. This can be used as a body splash or an additive for cleaning-water. This also makes a very gentle space purifier when misted around a room. To make herbal vinegar, place a handful of your chosen plant matter in a clean jar with a lid. Pour vinegar over it until it just covers the plant matter. Leave the vinegar to steep in the refrigerator for one to three weeks. Strain the vinegar into a clean bottle and label it with the name and the date. Use herbal vinegar in place of regular vinegar or as an additive to wash water for floors or windows. To make herbal oils, place a handful of your chosen plant matter in a small saucepan and pour a cup of light olive or safflower oil over it. Heat the oil and plant matter gently over a low heat for fifteen minutes, then pour oil and plant matter into a clean jar. Cover the jar with a double layer of cheesecloth and fasten with a rubber band. Allow to sit in a sunny spot for ten days to two weeks, then strain oil into a clean bottle, cap, and label with the name and date. Use the oil in cooking (if the plant matter is edible) or to anoint objects, windows, doors, and so forth. To make herbal or floral sprays, place a freshly made cooled infusion in a clean spray bottle and mist it into the air. Alternatively, place a few drops of a decoction or tincture into a bottle of clean water and shake to blend. It’s not the amount that matters; it’s the energy that the drops carry. To make floor washes, add an infusion, drops of decoction or tincture, or a few drops of essential oil to a bucket of clean water. Mop floor or dip a clean cloth into the wash water and wipe down walls, doorframes, window ledges, and so forth. For use in baths, add an infusion, decoction, or drops of tincture or oil to your bathwater. Here are some suggestions for herbal blends that can be used for various applications such as simmering potpourri; sprinkling or sweeping powders; in sealed bottles as talismans; or steeped, strained, and used as anointing potions. If you can’t stand the smell of one of these, or if you know your personal energy doesn’t interact well with it, leave it out or find a substitute with a similar energy. Find out more tips on how to be alone this holiday season from THE HOUSE WITCH by Arin Murphy-Hiscock. Excerpted from The House Witch by Arin Murphy-Hiscock. Copyright © 2018 by the author. Used by permission of the publisher. All rights reserved. Your home is an important part of who you are—it makes sense to tie your practice of witchcraft closely to the place where you build your life. 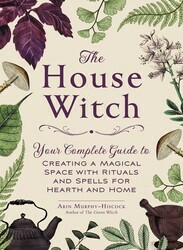 In The House Witch, you’ll discover everything you need to live, work, and practice in your own magical space. Follow expert Arin Murphy-Hiscock on a journey to building and fortifying a sacred space in your own home, with essential information on how to create magical cookbooks of recipes, spells, and charms; prepare food that nourishes body and soul; perform rituals that protect and purify hearth and home; master the secrets of the cauldron and the sacred flame, and much more! Learn how easy it is to transform your home into a magical place that enhances your practice and nurtures your spirit!